12" platform has 12" height, 13" x 13" top, 17" x 17" base, and weighs 16 lbs. 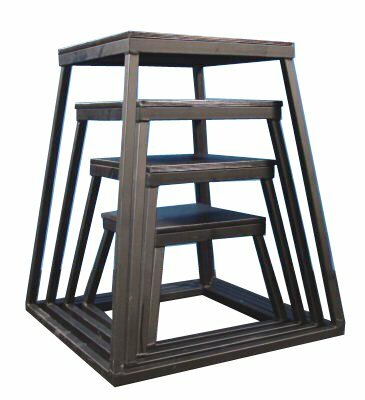 18" platform has 18" height, 14.5" x 14.5" top, 20" x 20" base, and weighs 21 lbs. 24" platform has 24" height, 16" x 16" top, 22.8" x 22.8" base, and weighs 25 lbs. 30" platform has 30" height, 18" x 18" top, 25.7" x 25.7" base, and weighs 30 lbs.